The diverter ground bed must have more ground rods than the energizer ground bed. Proper Installation of your lightning diverter is essential to its operation in the event of a lightning strike on the fence line. The easiest way to install a diverter is to use a cutout switch on the electric lead-out wire close to the where you will be installing the diverter. This makes adjustment easier. If installing the fence leave enough wire after crimping around the end or corner post to pass through the diverter and connect to choke coil. Otherwise use a Split Bolt Line Tap to connect to the main fence line. 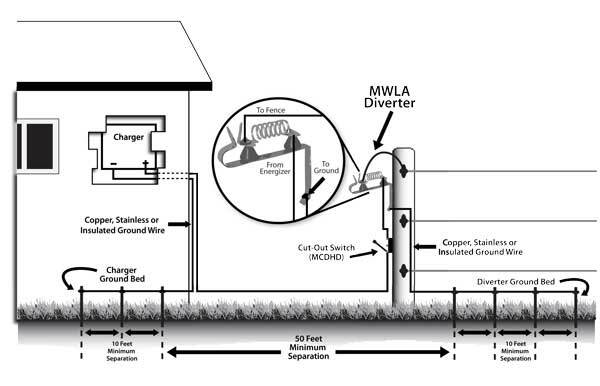 The diverter ground bed and charger ground bed should be separated by at least 50 feet.